I’ve just been honored by Greenfyre dedicating his very first blog in a long time to a couple of blog posts in my very successful “1970s Global Cooling Consensus” series. There’s the usual litany of insults, of course, yawn, and that’s fully compatible with the idea that poor Greenfyre and his acolytes have a strong urgency to repeat the same old concepts to themselves, somehow deluding themselves they’ll be stronger concepts. In the real world, meanwhile, there is a peer-reviewed paper stating “By the early 1970s, when Mitchell updated his work (Mitchell 1972), THE NOTION OF A GLOBAL COOLING TREND WAS WIDELY ACCEPTED, albeit poorly understood“. I wrote that sentence in big bold letters a few days ago, in a post sadly forgotten by all-singing all-dancing shouting, debate-challenged Greenfyre. Well, if Greenfyre has an argument with that peer-reviewed article, he might want to exchange a couple of words with Connolley himself, thank you. On the face of it, the whole debate about “global cooling in the 1970’s” is a matter of despair. If we can’t agree on what has happened less than 40 years ago, and is still remembered by many people, despite the avalanche of available snippets of information, a great deal of them accessible to all via the Internet…then what can we agree on? And what is the meaning of “history” at all?? So the only way to rescue our knowledge of the Renaissance, Ancient Rome or the Pharaos is by establishing that there is something special about the “global cooling the 1970’s debate“, something the unfortunately gets in the way and prevents people from recognizing what has happened within living memory. What is it? In fact, we now know that “the world” was not cooling at the time, but “the Northern Hemisphere” was. Only thing, the scientists in 1972 had no way to know it was just a Northern Hemisphere thing. All of this is actually quite inconsequential wrt the original question (once again: “Did the scientists believe in the 1970s that there was global cooling?“). 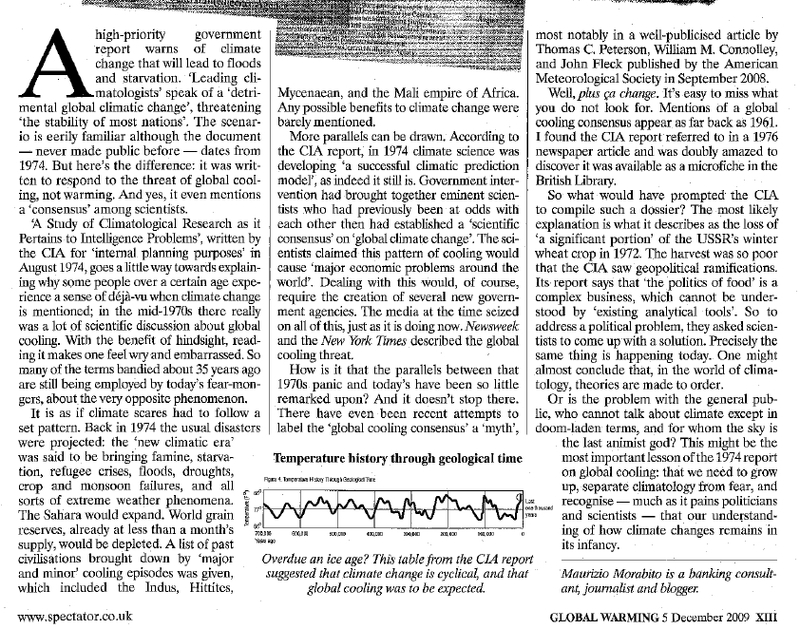 Anyway: in the published scientific literature, the global cooling idea started in fact evaporating in 1975, and had been replaced by global warming at full speed from 1979 or so (curiously, in sync with the PDO…). 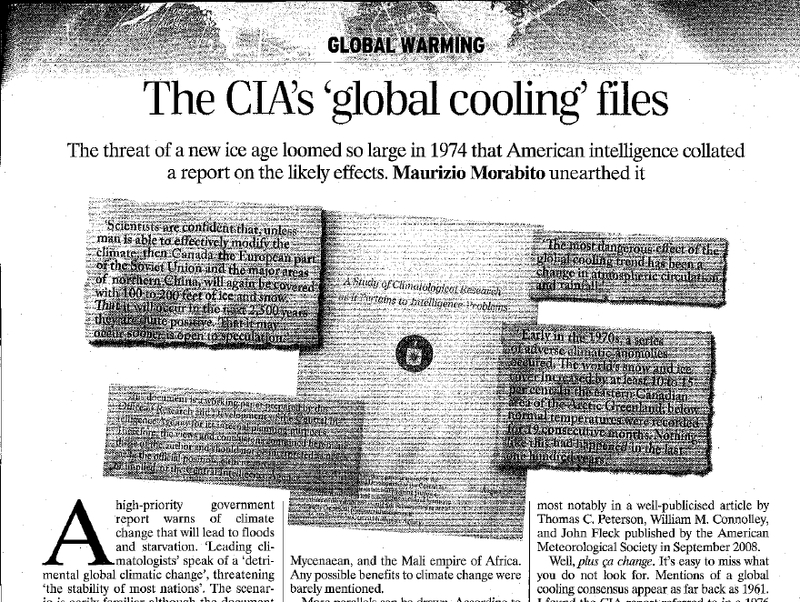 The same happened but much more slowly outside the world of research, so most people have been exposed to “global cooling” (actually, to global cooling consensus) well into the 1980s. I am not saying I have found the last word on this, but the story above makes much more sense than the usual worldwide newsmedia sensationalism conspiracy as suggested by those adamantly opposed to any memory of the global cooling scare. What is it, that they can’t digest, to the point of denying recent history even if it stares at them from the ink of their own writing? If one believes in contemporary global warming, the most obvious and logical reply to anybody saying “there was a global cooling consensus in the 1970s” should be “Yes, but…” followed by a long explanation on why the consensus is right this time and was wrong at the time. After all some consensuses have been right in the past, and some wrong. This would cut off all sorts of sterile polemics and actually contribute to an increase in reputation of the average warmist daring to launch into such an argument, facing reality rather than fudging it. But nobody goes in that direction. Why? As far as I can understand it to date, there are two main reasons for such a peculiar behavior: the AGWers’ unhealthy attachment to catastrophism (that forces them into defending absurdist ocean-boiling claims), and their single-minded determination not to allow the mere possibility of anybody uttering any suggestion that anything about AGW could be wrong, unless “it’s worse than we thought!” (that forces them into trying to rewrite history, personally attack any disbeliever, blowing up schoolchildren in comedy videos, and all sorts of nasty stuff). In the AGWer world it is worse than blasphemous even to try to remember that, not so many years ago, there was indeed a climate worry, only it was a worry about the world getting cooler, rather than warmer. With so many easy-to-spot mirror claims (eg Pakistan floods because of cooling then, Pakistan floods because of warming now) logic dictates that the wall of evidence needed to convince people to really care about AGW becomes taller by the minute. And the one needed to acquire the political will to work against catastrophic climate change, it becomes impassable. This explains why the discussion about global cooling in the 1970s often degenerates with people stupidly claiming “there was no consensus in the 1970s about an ice age“. Yes, there wasn’t. But who cares? Even a cooling of a few degrees, not exactly an ice age, was presented as very worrying, and potentially as harbinger of catastrophes. Hence, the “ice age” mention is pointless. Like the “AGW is a logical impossibility” page, the discussion about the global cooling consensus in the 1970s on this blog by itself will never be enough to put the antiscientific claims about upcoming catastrophic AGW to rest. At the end of the day, those pages are “just” reminders that we should avoid leaps in the dark, and always be very aware of our hubris. Anyway…for me at least, these two subjects are evolving into a kind of “litmus test” that will help to tell the honest warmers from the rabid ones. The honest ones, you see, don’t worry about facing reality, including history. From Italy to the USA. Thanks to Google. And Google. And Google. Really, try to read that article all without a chuckle or ten. I certainly support letting everybody perfectly free to use their own definitions. As long as it is clear what they are talking about. That 1961 New York meeting I have blogged about, was sponsored by the American Metereological Association and The New York Academy of Sciences. That should be enough to consider it an important conference. And it was co-chaired by Rhodes W. Fairbridge, not a minor figure in the last 40/50 years of climatology. 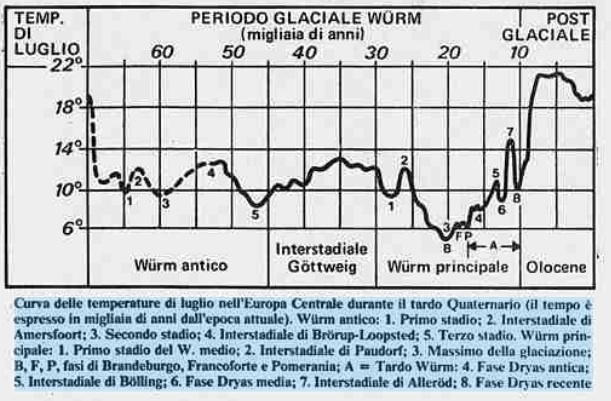 Furthermore, it was followed by another meeting in Rome, organized by UNESCO and again with major climatologists in attendance (J. Murray Mitchell, Jr. C. C. Wallén , E. Kraus). Once again in Rome, they all agreed that the world was cooling. The full proceedings are available and I extracted some interesting snippets. If scientific experts meet once, and then meet again, and there is general agreement among them that the world is cooling, I’d say most people will agree that THAT is evidence for “global cooling scientific consensus”. I am just using perfectly common and sensible definitions for “cooling”, “global” and “consensus”. If instead you decide e.g. that “global cooling” has to mean “predicting future cooling”, feel free to do so: but please do yourself a favor and provide reasons for your choice. Because of course the more we restrict a definition, the less the chance that anything will fall into that category. This “restricting the definition until there is nothing left” is after all what Thomas C. Peterson, William M. Connolley, and John Fleck have done in their largely mistitled “The Myth of the 1970s Global Cooling Scientific Consensus”. In the previous blogs in the series, we have seen how the very statements made by Thomas C. Peterson, William M. Connolley, and John Fleck’s (PCF) “The Myth of the 1970s Global Cooling Scientific Consensus” can be used to demonstrate that there was indeed a global cooling scientific consensus, in the 1970s. The whole concept of the “myth” is merely based on definitions. Besides, PCF’s own methodology meant disregarding almost everything written about global cooling anyway. Moreover: they have been cavalier with the temporal series of events. What is the meaning of “the 1970’s”? In the “Perpetuating the Myth” Box (page 1326, page 2 in the PDF file), PCF are particularly disingenuous in their criticism of Singer and Avery (2007), Balling (1992), Giddens (1999), Michaels (2004) and pretty much everybody else. PCF: “Indeed, the Earth appeared to have been cooling for more than 2 decades when scientists first took note of the change in trend in the 1960s. The seminal work was done by J. Murray Mitchell [in 1963, showing that] global temperatures had increased fairly steadily from the 1880s, the start of his record, until about 1940, before the start of a steady multidecade cooling (Mitchell 1963). By the early 1970s, when Mitchell updated his work (Mitchell 1972), the notion of a global cooling trend was widely accepted, albeit poorly understood. What one could say is that Singer, Avery, and most of those mentioned in that Box, are as guilty as PCF in viewing the 1970’s with glasses tinted with today’s mindframes (eg exaggerating any mention of “global cooling” into “ice ages”). The U.S. National Research Council report they refer to, is from 1979. How could people know about that report, in 1975? PCF’s analysis is not temporally sensible. In a lyrical passage, PCF state their research is all the more interesting because it shows the emerging in the 1970s of “the integrated tapestry that created the basis for climate science as we know it today“. That’s a myth in its own right, and the topic for the next blog in the series.